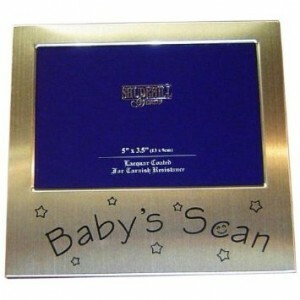 Baby Scan Photo Frame is a very cute photo frame in brushed silver coloured metal. Every expectant parent is proud to show off the scan picture of their imminent new arrival. These frames make a lovely gift for Mum or Dad as they discover their happy news. The frame is 13cm x 9cm and arrives in a presentation box. It has the words Baby's Scan below the space for your photograph. Very cute!